From the author of the New York Times bestseller The Dressmaker of Khair Khana comes the poignant and gripping story of a groundbreaking team of female American warriors who served alongside Special Operations soldiers on the battlefield in Afghanistan­—including Ashley White, a beloved soldier who died serving her country’s cause. 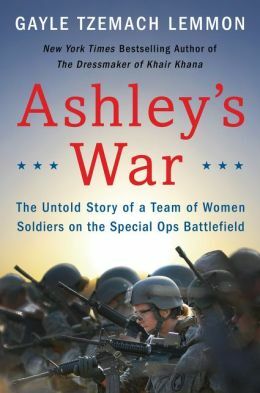 In Ashley’s War, Gayle Tzemach Lemmon uses exhaustive firsthand reporting and a finely tuned understanding of the complexities of war to tell the story of CST-2, a unit of women hand-picked from across the Army, and the remarkable hero at its heart: 1st Lt. Ashley White, who would become the first Cultural Support Team member killed in action and the first CST remembered on the Army Special Operations Memorial Wall of Honor alongside the Army Rangers with whom she served. Gayle Tzemach Lemmon is a Senior Fellow at the Council on Foreign Relations and a contributor to The Atlantic’s Defense One. She is the bestselling author of The Dressmaker of Khair Khana and writes regularly for leading media outlets. A Fulbright scholar and Robert Bosch Fellow, she began reporting from conflict regions during MBA study at the Harvard Business School following nearly a decade covering politics at ABC News.